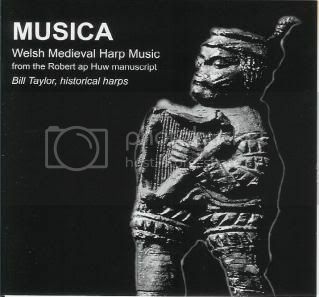 Bill has just released a new CD of Welsh medieval harp music from the Robert ap Huw manuscript. Titled "Musica" (the name of the manuscript), it contains 12 tracks played on two historical harps, a 21-string romanesque harp and a 26-string late medieval bray harp. Also included are essays by Robert Evans as well as Bill. Recorded at Taith Studios in Abergavenny, and produced by Robert Evans, Dylan Fowler and Bill Taylor. £10 plus postage, available from Bill.